Applicant is traveling abroad so frequently and to countries which require visas that they are unable to meet deadlines. An example of this would be traveling to China departing in 3-4 days and returning 10 days later, then departing to Russia 3 days after returning from China; this itinerary wouldn’t allow for a person to travel and get visas within the allotted time they have. The State Department allows the issuance of the 2nd passport when evidence of such a travel conflict is stated and proven. This is achieved through formal requests and fight reservations showing travel intentions. Download complete and sign the State Department Letter form. This form is a formal request for a 2nd passport which is required by the US State Department. Must be on official Letterhead of the company requesting the 2nd passport to be issued in your behalf. Address the letter to the US State Department, Passport Services (no address required). Have the company formally request that the State Department grant or issue you a 2nd passport and explain the circumstances. Make sure to be specific respecting dates and International destinations and if you do or do not need visas to these destinations. Signed by appropriate company representative. Submit ONE recently taken passport type or size photograph. Do not submit pictures with eyewear (glasses), headwear, jewelry, or with anything objects in the background, as they will not be accepted. Passport Photo MUST have a completley blank white background, without any other shades or tints (i.e. dark gray, tan, off-white). See below for proper sizing and examples of well composed photos. Click Here for a description of the State Department requirements on passport photos. 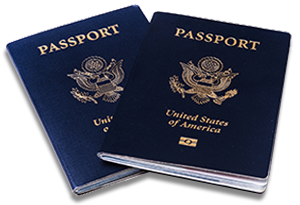 Submit evidence of your International Departure date (flight reservations) showing at least 2 separate flights which validate and corroborate the need and request for a 2nd passport. If you haven’t made your reservations yet please let us know. Do You Need a Visa to Travel to your Destination? Would you like to add this passport to your cart?